What does the Bible say about food struggles? Whether the struggle is with excess weight, unwanted cravings, total control, or extreme diets, we all have a relationship with food. In fact, many of us are so consumed with this aspect of our lives that we've developed a food fixation. Our obsessive thoughts about food, about what to eat and when, may be signaling a deeper spiritual issue. Whatever your relationship with food, Full can open your mind and heart to surprising spiritual truths and free you to approach food rightly. 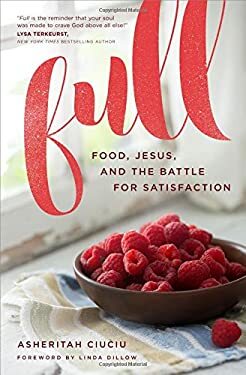 Unpacking a theology of food and sharing stories of women who have overcome food fixation, Asheritah Ciuciu helps readers engage this issue in a practical and holistic way. Full reveals12 biblical principles that can break the power of food and free us to taste and see that God is good.